For most, Friday the thirteenth is synonymous with bad omens, bad luck, and superstition. For others it brings to mind Jason Voorhees or even just slasher films in general; almost like a horror fan’s mini Halloween. For me, it’s something all together different. Today, February 13, is my birthday. I was born on this day in 1970. On a Friday. I shared the day with two great events in music history regarding artists that I happen to be very passionate about. Black Sabbath and Black Flag. Sabbath released their debut album the day I was born, and Henry Rollins (singer for Black Flag) celebrated his ninth birthday on that day. Though I made none of my own musical contribution on that day—other than give the world my very first scream—I am proud to share the day with them and I regularly boast about it, even to Henry Rollins himself when I write every year—without fail—wishing him a happy birthday. He always writes back. But enough with the birthday boy. Let’s get on with the fun stuff. For your entertainment, I’ve compiled a list of little-known facts concerning all things 13. 1 Lizzy Borden uttered a total of 13 words at her trial. 2 There are 13 steps leading to the gallows, 13 loops on the noose and a guillotine blade falls from 13 feet high. 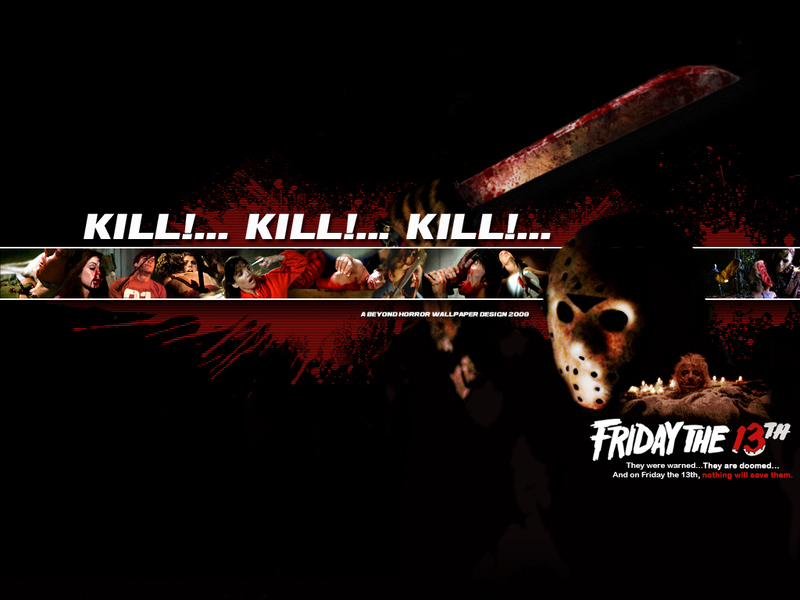 3 For the Friday the 13th films, Composer Harry Manfredini stated that contrary to popular belief, the famous “Chi, chi, chi; ha, ha, ha” in the film’s score is actually “Ki, k,i ki; ma, ma, ma”. It is meant to resemble Jason’s voice saying “Kill, kill, kill; mom, mom, mom” in Mrs. Voorhees’s mind. This was inspired by the scene in which Mrs. Voorhees seems to be possessed by Jason (or just out of her mind, crazy) and chants, “Get her, mommy! Kill her!” Manfredini created the effect by speaking the syllables “ki” and “ma” into a microphone running through a delay effect. 4 In the original Friday the 13th movie, writer Victor Miller had originally given Jason the name of Josh. After deciding that it sounded too nice, he changed it to Jason after a school bully. Victor also admitted that he was purposely riding off the success of John Carpenter‘s Halloween. 5 Fittingly, director of psychological thrillers Alfred Hitchcock was born on the 13th — Friday, Aug. 13, 1999, would have been his 100th birthday. 6 Paraskevidekatriaphobia is the fear of Friday the 13th. 8 In the first Friday the 13th film, Alice runs back into the cabin after discovering Bill and starts piling things in front of the door even though it opens outwards. 9 Killers Charles Manson, Saddam Hussein, Jeffrey Dahmer, John Wayne Gacy, Theodore Bundy, and Jack The Ripper each have 13 letters in their names. 11 At the plea of a single Jason Voorhees enthusiast, the ending of the Friday the 13th remake was completely reshot when a fan walked up to the producers at Comic Con that year stating: “Whatever you do in this remake, never, ever take Jason’s mask off.” They had already shot the sequence revealing Jason’s face but got spooked by the fan’s statement, and thus re-filming took place. 12 Over 160 people have been killed by Jason Voorhees in the Friday the 13th movies, including Freddy vs. Jason and the remake. 13 In the original Friday the 13th movie, Alice’s dream sequence with the surprising ending was inspired by Sue Snell’s nightmare at the end of the movie Carrie. (I don’t know about you, but they both scared the crap out of me as a kid). Ha! Now I kind of want someone to review the young adult novels! Most of that was news to me. I used to be a big fan of the Friday the 13th series, but I haven’t watched any of the movies in a long time. My favorite when I was a teenager was the one where he went to New York. It wasn’t good, but it was fun. The one where he was in space was just horrible. I mean it wasn’t leprechaun in space bad, but … now I am off on a tangent. St. Patty’s day is coming up isn’t it?